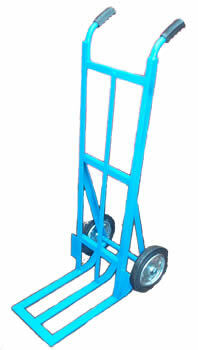 This hand truck is an extra heavy-duty hand truck for use where heavy loads are continually being moved around. This Heavy-duty Sack Truck is fitted with 10″ wheels to give it a greater carrying capacity of up to 500Kgs. This hand truck can be fitted with leg rest for horizontal loading or without it is an excellent workhorse under any conditions. For more information on Handling Equipment, Sack Trucks and Hand Trolleys, please contact us.